Former West Ham United and Tottenham boss Harry Redknapp says he would be interested in succeeding Gordon Strachan as Scotland manager. Strachan stepped down earlier this month after failing to guide his country to the World Cup. The Englishman, 70, was sacked by Birmingham City in September after a run of six straight defeats. "Of course," the veteran manager replied when asked if the Scotland vacancy would interest him. "It must be a fantastic job to have. I think Gordon did what he could." 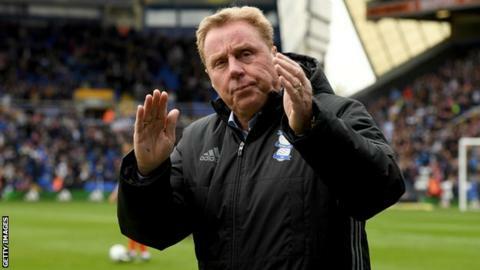 Redknapp has taken charge of eight clubs south of the border since 1983, and says he enjoyed watching Scotland's final two World Cup qualifiers - a 1-0 win over Slovakia, and a 2-2 draw in Slovenia that saw them miss out on the play-offs. "I must be truthful, I watched the Scotland games and not the England games, because there was nothing on the England games," Redknapp told BBC Scotland. "Those last two Scotland games, the win against Slovakia, the late goal, I kicked every ball that day. "Then I thought Scotland had a chance, and then 1-0 up in the second game (against Slovenia), it would've been a real great achievement to have qualified, but I think Gordon did what he could. It's a difficult job. "I wouldn't see myself having any chance of getting it, but it would be a great job for someone." Former Scotland striker Joe Jordan, who worked alongside Redknapp at Portsmouth, Tottenham and Queens Park Rangers, is among those being linked with the national vacancy. "Joe would be a good man - you'd have your life on Joe, he's a fantastic fellow," Redknapp added. "You'd have him on your side any day of the week. "He's a very quiet gentleman away from the pitch for someone who was so aggressive on it. But when Joe speaks, you listen, because he talks an awful lot of common sense."